Most of brokers make slippage for your orders (stop orders or market orders). When you make limit orders (Buy or Sell), they don't make slippage for you. Because it is for your advantage. This EA will resolve limit slippage problem for you with any brokers. The price now is 1.31450, you put sell limit at 1.31500. If the price jumps to 1.31550. 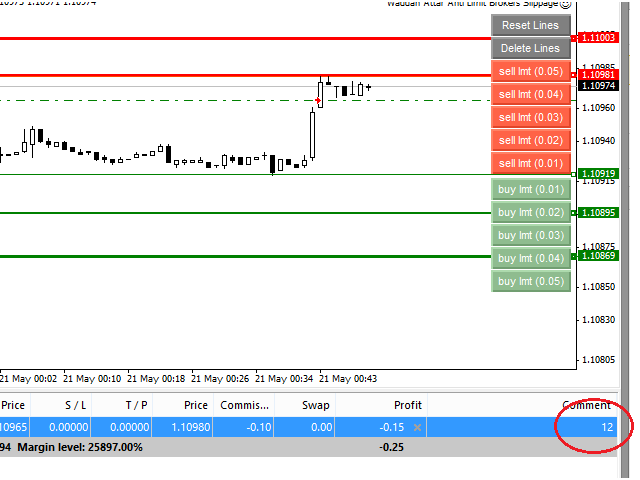 The Broker will execute your sell limit at 1.31500 NOT 1.31550. 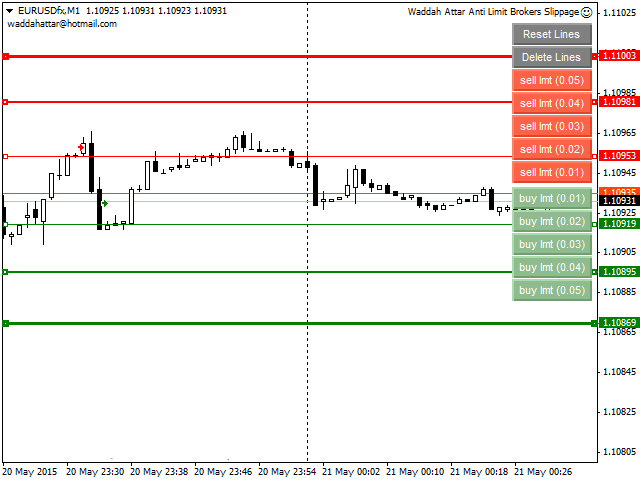 If you put buy stop, the Broker will execute it at 1.31550 (or more) NOT 1.31500. This EA will try to execute your sell limit at price 1.31550 or above. Just draw horizontal line with Red color above the current price on the chart as sell limit location and draw horizontal line with Green color below the current price on the chart as buy limit location. Run the EA on the chart and let it handle your limit orders for you. You can put as many red or green lines on your chart as you wish. You have five slots to put your custom lot. Every line has width property (width 1, 2, 3, 4 and 5). Every width value is equal to lot slot in EA properties. Width 1 is equal to Lot1. Width 2 is equal to Lot2. You can draw red or green lines manually or just clicking buttons on the chart. BuySL=0; //Buy Stoploss in points. BuyTP=10; //Buy Takeprofit in points. SellSL=0; //Sell Stoploss in points. SellTP=10; //Sell Takeprofit in points. Lot1 = 0.1; //the lot for line width 1. Lot2 = 0.2; //the lot for line width 2. Lot3 = 0.3; //the lot for line width 3. Lot4 = 0.4; //the lot for line width 4. Lot5 = 0.5; //the lot for line width 5. 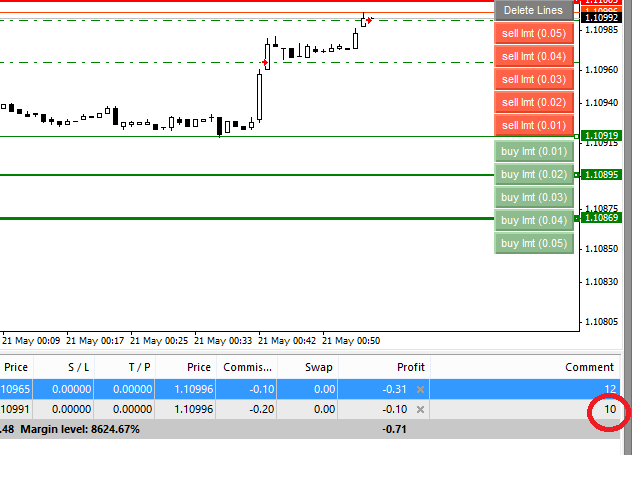 ReversalPoint = 4; // (very important property) How many pips will price go back to enter limit order after it crosses line limit. AutoTpToLimit=true; //When TP > 0... convert limit order TP to limit line automatically. AutoComment=true; //Writes in comment how many point you gain by the EA in this limit order. AutoDeleteLine=true; //After executing a limit order deletes its line immediately. LimitDistance=100; //When you click the limit button on the chart, distance in point between current price and limit line. PlayOkSound=true; //Play Ok Sound with execution of an order. Reset Lines: after executing line limit it will be disabled. If you want to enable it again click the Reset Lines button. Delete Lines: delete all lines on the chart. Sell Limit and Buy Limit buttons draw lines of sell or buy limit with a same lot specified in the EA Lot properties. This EA DOES NOT trade for you as auto built-in strategy. You must draw lines of limit orders according to your strategy. The EA shows order comments in the terminal window to see how many points you gain with every order (AutoComment must be true also). This EA is excellent for news traders and scalpers who love limit orders. PLEASE use this EA on DEMO account to understand 100% how its works. THEN use it on your REAL account.